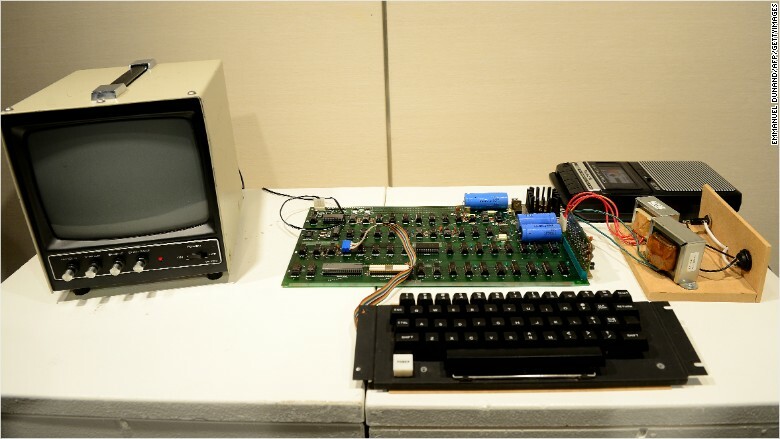 A recycling facility in Silicon Valley is trying to trace a woman who dumped a rare Apple 1 computer, which just sold to a private collector for $200,000. The company wants to give her a cut of the proceeds: $100,000. The firm -- CleanBayArea -- said the woman dropped off boxes of old gadgets and "e-waste" one month ago, but didn't leave any contact information. "She said that her husband had passed away and that she had decided to clean up their garage," the company said in a statement. After searching through the boxes a few weeks later, a recycling manager found the collector's item and arranged for a sale. Apple (AAPL) founders Steve Jobs and Steve Wozniak famously created the Apple 1 -- the firm's first desktop computer -- in Jobs' family garage in 1976. About 200 Apple 1s were built, and roughly 50 are believed to still exist -- most of them not in working order. In 2013, a rare working model of the Apple 1 sold for more than $671,000 at an auction in Germany. Another sold in 2012 for $375,000. Prices for the devices have gone up since Jobs' death in 2011.